Glasses that not only reduce blue light glare (some of us stare at screens all day),. but also monitor posture to help combat the “Screen Hunch.” Medical Wearable Solutions introduced The Eyeforcer smart technology to help reduce neck pain and damage that can occur as people look down at their devices. It utilizes sensor technology to measure the angle at which users are looking at handheld electronic devices. If a user is in a damaging position, a small LED light on the side of the frame will be activated and won’t turn off until the user fixes their position. It also has an accompanying smartphone app that will alert the user of poor posture while using the device. The eyeglasses also include blue-light filtering lenses that can protect against blue lights emitted from screens. The Japanese tech company, Omron, introduced its Omron Heartguide smartwatch at this year’s show in Vegas. The company claimed this watch will be able to take medical-grade measurements and night readings to test for hypertension and measure the risk of a stroke while sleeping. During 2018, the smartwatch went through clinical testing, and by the end of the year, the FDA gave it the green light. Thus, Omron started to market the blood pressure watch in early January. 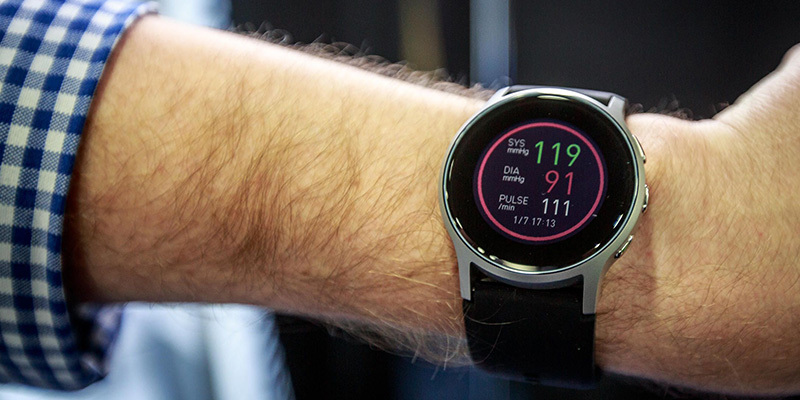 As it could actually mean the end of outdated blood pressure cuffs and traditional measurement, the smartwatch could be a game-changer. Hearing solutions manufacturer, Oticon, recently introduced the rechargeable Opn hearing aid as well as the Dynamo for severe hearing loss. This year, the company presented its Kaizn smart algorithm-powered hearing aids. A.I. built into Kaizn learns wearer’s listening preferences, habits, and environments from a hearing aid to predict their choices in a particular sound scenario and automatically adjust their hearing aid settings for the best listening experience. Helite, who revolutionized the wearable airbag for motorcycle riders and equestrian use, has introduced the Hip’safe. This product is a wearable airbag designed to protect your hips in case of a fall. This may help topple the “King of OSHA violations”; Fall hazards. L’Oréal unveiled its UV Sense at CES this year. This wearable is designed to monitor how much UV light exposure someone is receiving. The battery-free device measures at 2mm thick and 9mm in diameter. It is an electronic sensor that can be stuck to sunglasses, clothes, shoes and even on the fingernail. When paired with a smartphone app, the device will provide warnings related to the sun exposure of the user. These are just a few of the stand-out products from CES 2019 designed to improve health and safety. If you have any questions regarding these devices or would like more information on how to bolster your company’s health and safety program, please contact me at (919) 459-5240 or rcampbell@ei1.com.